It’s both sad and comforting to know that, on the other side of the world, people are as distrustful of the mainstream media as they are in America. Rann (“Battle”) explores news organizations’ struggle for ratings supremacy and their ability to steer public opinion based on their coverage of news stories. Amitabh Bachchan stars as Vijay Hashvardan Malik, a TV news pioneer who prides himself on truthfulness. As Vijay’s network loses advertisers to rivals that engage in tabloid journalism, his son, Jay (Sudeep), struggles to convince him to add more sensationalism to the network’s broadcasts. With the network’s financial trouble widely known, Jay’s brother-in-law, Naveen (Rajat Kapoor), proposes to Jay a plan to save the network: favorable coverage of a shady politician named Mohan Pandey (Paresh Rawal) in exchange for advertising dollars from Naveen’s company. Jay conveniently comes into possession of a video that tarnishes the reputation of Pandey’s main political rival. Jay convinces his father to broadcast the video in the name of truthfulness, and suddenly the network’s financial problems disappear. A new reporter at the network, Purab (Ritesh Deshmukh), grows suspicious and investigates the politician’s story. What he discovers shakes his faith in the industry and in Vijay, the man who inspired him to become a journalist. The collusion between the industrialists, politicians and networks is eerie and believable. Bachchan and Deshmukh are quietly effective as a pair of idealists who come to realize that they’re playing a rigged game. Rawal is especially creepy as Pandey, who laughs off the bloodshed he inflicts as though it were a natural part of politics. Despite the universal appeal of the story, American audiences may struggle with poorly translated English subtitles. The subtitles also occasionally get lost against background shots of news programs with moving crawls at the bottom of the screen. 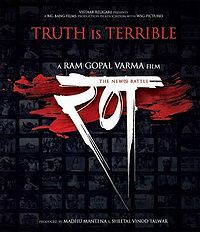 I’ve only seen two of Ram Gopal Varma’s films, but it’s clear that he’s an auteur with a distinct style and a love of filmmaking technique. In fact, I’d say he suffers from an over-reliance on camera technique. His cameras constantly swoop for dramatic effect and zoom in for close-ups of the actors’ faces. On those rare occasions when the camera is static, it’s positioned underneath a glass coffee table, or the shot is framed by an actor’s foot resting on said coffee table. Varma also inserts hilariously over-the-top musical cues to alert the audience whenever anything of import happens. I found these directorial tics distracting in Varma’s Sarkar Raj, and they bugged me in Rann, as well. Rann‘s plot is riveting and so well acted that I wanted to focus on the story, not on the cinematography. With a story this good, we in the audience know how we’re supposed to feel without the aid of directorial gimmicks. Rann‘s runtime is 2 hrs. 25 min. This entry was posted in Reviews and tagged 2.5 Stars, 2010, Amitabh Bachchan, Bollywood, Hindi, Indian, Movie Review, Paresh Rawal, Rajat Kapoor, Ram Gopal Varma, Rann, Ritesh Deshmukh, Runtime, Sarkar Raj, Sudeep on January 30, 2010 by Kathy. Thanks for clarifying that, prashal.